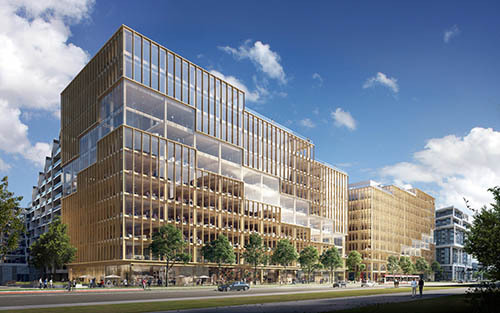 Hines, a Houston based global real estate owner, developer, and manager has announced the tallest timber office building in North America according to information in Architect magazine. This is not Hines’ first venture into cross laminated buildings as it previously developed the T3 Building in Minneapolis in 2016. This 7-story office building was the tallest mass timber building in the US at that time. Additionally, they recently announced a 10-story office building in Atlanta named T3 West Midtown building also incorporates Timber elements. The University of British Columbia Brock Commons building in Vancouver currently holds the record at 18 stories but is a student housing facility and not an office building like the T3 Bayside Building. As various Mass Timber Projects are being planned across Canada, a number of cities in the US are changing their zoning and building codes to accommodate the new building systems. Additionally, since the structures are built using cross grain elements, trees that are 5 inches in diameter can be harvested to make up the cross-grain timber elements. According to several sources, this means that younger trees hidden by the canopies of first growth taller trees can be harvested leaving the taller trees in place. This avoids the clear cutting of those trees and maintains the forest cover while at the same time providing usable materials for the Mass Timber buildings. It is of note that Hines’ Houston office is developing a high rise in downtown Houston that is being built as a Construction Career Collaborative or C3 project, leading the way to a more sustainable craft workforce and to continuing Hines reputation for developing high-quality office buildings around the globe.